Unwittingly promoted to whistleblower in case of toxic gas attacks, a country rat tells about his daily life in the trenches during the Great War. 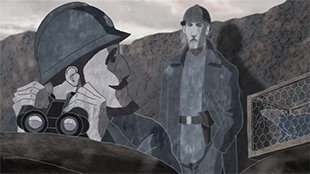 The point of view is original, critical and humorous, and at the same time compassionate with the « poilu » (the WWI French soldier), portrayed as a rat trapped in a cage in the midst of this monstrously absurd conflict. Some festivals : Cine Junior – Cine Court Anime à Roanne – Trois jours trop courts (Castres) – And abroad : Be there Corfu – Animfest (Athens) – Cartoon on the bay (Italie) – Mediawave (Hongrie) – Animamundi (Brazil) – Animanima (Serbie)….